Ferizaj (Albanian) or Uroševac (Serbian) is a town in Kosovo. Buses from Skopje to Pristina stop at the bus station here. 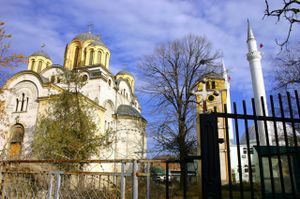 Serbian Orthodox Church of Saint Emperor Uroš next to the Derviş-Paşa Mosque. While you are in Ferizaj make sure you visit the Orthodox church and mosque. Its one of the only places in the world were both places of worship are wall to wall. Mosque was erected in 1881 by Derviş-Paşa, to commemorate Ottoman victory over Albanians during a Prizren League uprising. Serbian Orthodox church of Saint Emperor Uroš was erected between 1929 and 1933, and is dedicated to the last emperor of Serbia, Stefan Uroš V (1337-1371), venerated as saint in the Orthodox church. The church is closed most of the time since most of the Serbian population of Ferizaj/Uroševac was killed or banished during the Kosovo war of 1999, when the church was also desecrated by Albanian militants. Renovation works on the home for the parish priest started in 2013, and the priest has returned (as of 2014), so it is again possible to visit the church. Entrance is free. There is a great hamburger place in Ferizaj located down the main street running thru the city. They call themselves McDonalds but don't expect to get a Big Mac. This page was last edited on 12 September 2014, at 14:35.